If Georg Friedrich Händel's (1685 – 1759) first published collection of concerti grossi, the 6 Concerti grossi, Op. 3 of 1734, HWV 312-317, seems a bit imbalanced and at times even peculiar, it is only fair to mention that Handel himself seems to have had nothing whatsoever to do with putting the volume together. Indeed, it isn't at all certain that Handel even intended the music of Op. 3 to be molded into a series of multi-movement ensemble concertos; it seems rather that publisher John Walsh, seeking to cash in on the commercial success of Corelli's famous Opus 6 Concerti grossi, simply threw a few dozen already existing Handel works together and, grouping them into six "concertos," gave them the name by which they are still known. Though the concerti grossi of Op. 3 suffer somewhat from the ramshackle circumstances of their birth--it is probably well, for their sakes, not to compare them too much with Handel's other collection of works in the form, the superb Opus 6--as a testament to the richness of their composer's musical language, and to the musical adaptability that has earned Handel the nickname "The Great Chameleon," they are unimpeachable. The variety of design in Op. 3 is rather enjoyable. Just one of the six concertos are cast in the usual four movements, the other four having anything between two and five. Only on a few occasions does Handel (and/or Walsh) choose to set up the instrumental forces in the traditional concerto grosso manner, i.e. a tutti group and a contrasting, soloistic concertino group. The concertos, however, are filled with virtuoso solo passages for both the string and the woodwind players, and so the spirit of the concerto grosso tradition is intact even if the rigid delineation of performing forces is absent. Probably the earliest of the Op. 3 music is contained in the very first concerto of the volume, the Concerto grosso in B flat major/G minor, Op. 3, No. 2. The first of its three movements is in B flat major, the last in G minor. While such asymmetry of tonal design was by no means unheard of, it certainly cannot be considered standard practice for the eighteenth century. The opening movement of the five-movement Concerto grosso in B flat major, Op. 3, No. 2 bears a close relationship with Handel's Brockes Passion of 1716; unusually, a pair of dance movements--a minuet and a gavotte--wrap the Concerto up. 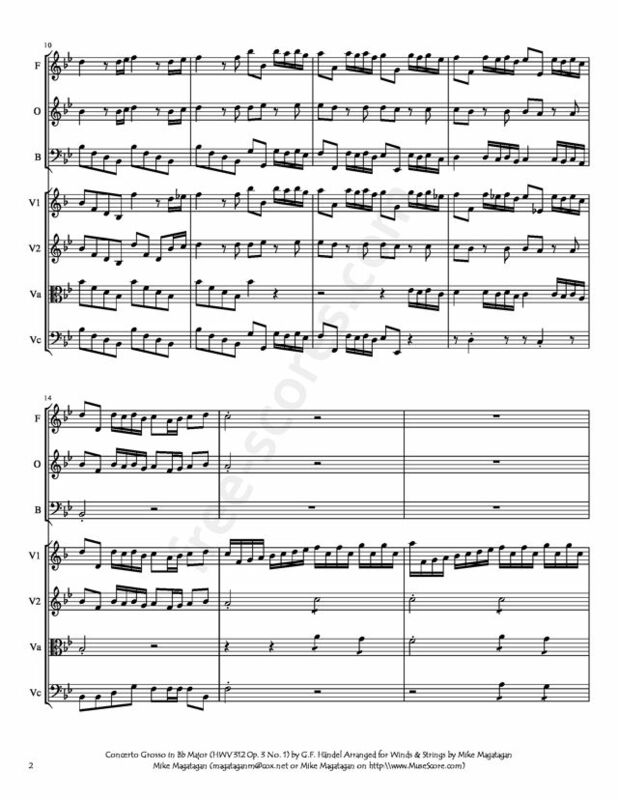 The third Concerto (G major, in which the oboe is optionally to be replaced by a flute) is again in three movements (the opening Largo is so brief that it really cannot be counted as a movement unto itself), while the Concerto grosso in F major, Op. 3, No. 4 is one of the two pieces in the opus that follow a four movement framework. The layout of this striking work is anything but typical of concerto grosso style, however, as the music was lifted straight from the multi-sectioned overture to the 1715 opera Amadigi di Gaula. Save for the addition of an extra allegro movement at the very end, the Concerto grosso in D minor, Op. 3, No. 5--and for the lack of division into tutti and concertino--follows the traditional Italian model closest of all the Op. 3 works. 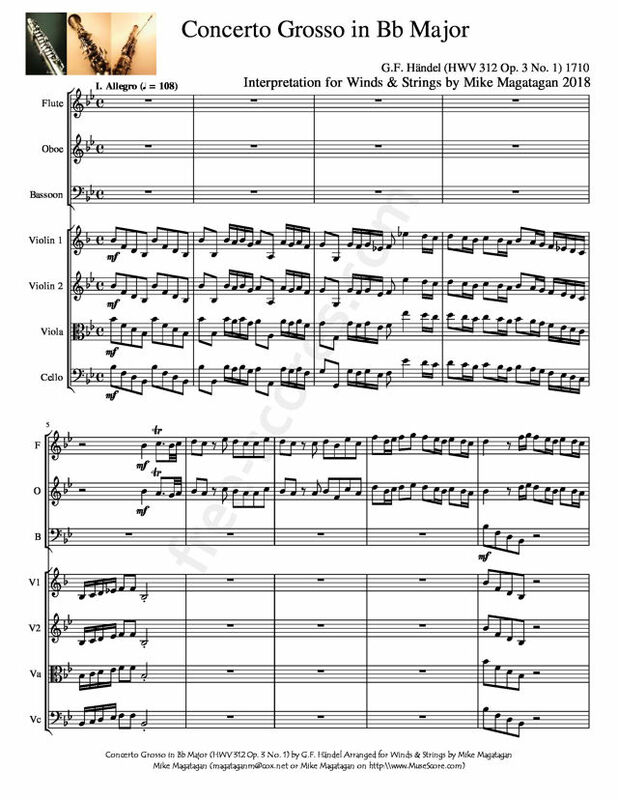 The final work of the volume, the Concerto in D major, Op. 3, No. 6, has just two movements, and both are fast. 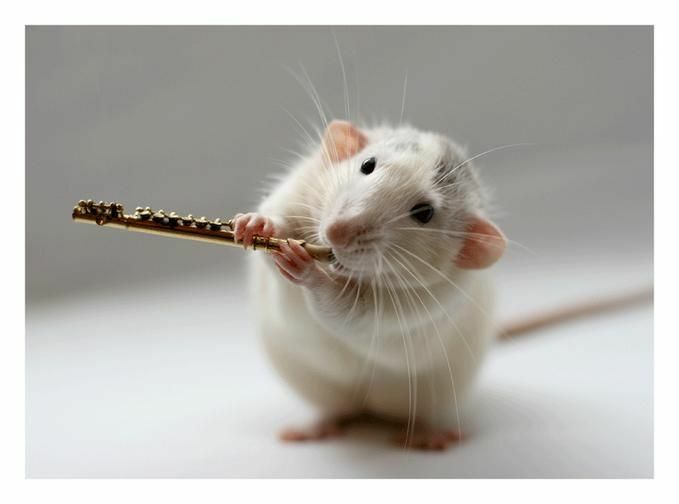 The Vivace, whose music is extracted from the 1723 opera Ottone, casts the two oboes in starring roles, while in the Allegro, taken from the overture to the 1712 opera Il pastor fido, we are treated to a sparkling, two-sectioned minuet. Although originally written for Baroque Orchestra, I created this Interpretation of the Concerto Grosso in Bb Major (HWV 312 Opus 3 No. 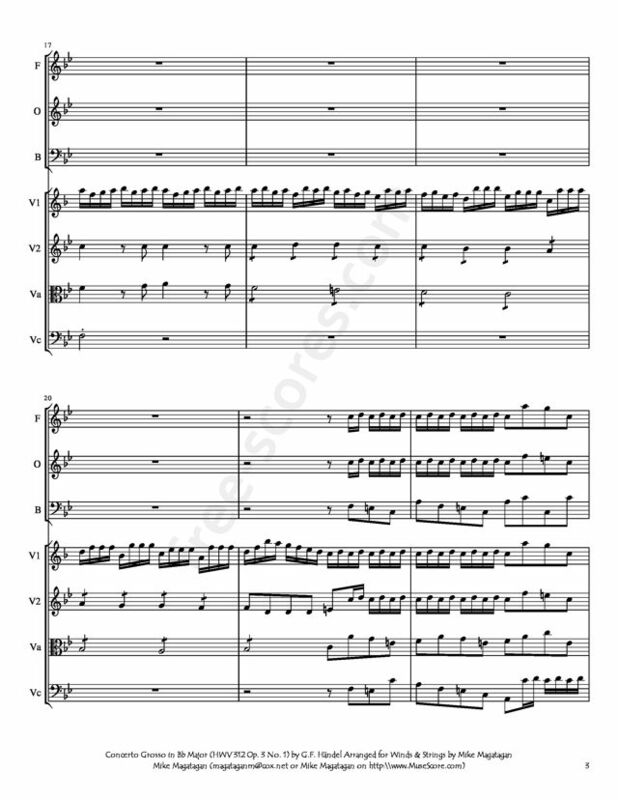 1) for Winds (Flute, Oboe & Bassoon) & Strings (2 Violins, Viola & Cello).